The recent surge in Twitterers using a mobile browser has brought on the necessity for a mobile version of the Twitter website. Users don’t just want to read their friends’ tweets as texts, they want to read them in one cohesive interface. Besides making things more organized, this saves many users valuable money in text messaging fees. The release of the iPhone has created two terrific and full-featured applications for mobile browsers: Hahlo and PocketTweets. Both help to supplant Twitter’s generic mobile website. Twitter, as any good company should, has responded to the requests of its users for a mobile Twitter page and launched Twitter Mobile, accessible at m.twitter.com. The service provides only the bare necessities. There’s access to a list of your friends, your friends’ tweets, and your personal tweets. Beyond that, Twitter Mobile doesn’t really provide the user with much. Furthermore, the interface is drab and not very pretty. Tweeting is done from the top of the window in a small text box. For users looking for simplicity and only a small range of functions, Twitter Mobile fits the bill, but it’s going to be subpar for everyone else. 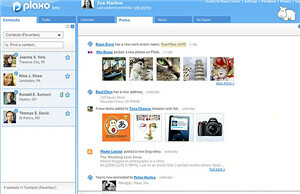 PocketTweets recently launched, several days after the release of Hahlo. When I first used it, I went in thinking that nothing could trump Hahlo’s clean lines and gorgeous black interface. Within minutes, I knew I was wrong. PocketTweets reminds me somewhat of design on a Mac, smooth and consistent with varying degrees of eye candy and supreme functionality. Logins and text entry are handled with text overlays, dimming the background while bringing up a gray popup. 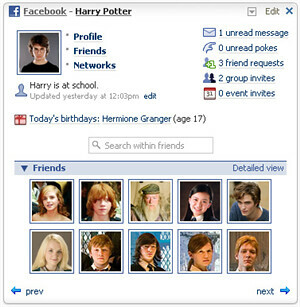 Users are given far more options as well, with a unique toolbar at the bottom populated with customized icons. PocketTweets allows users to visit the homepage and public timeline, along with the possibility to visit their friends’ timeline, their direct message inbox, and an archive of past tweets. Although not distinctly iPhone, PocketTweets’ interface manages to look better than almost every made-for-iPhone web app out there. Hahlo was the first Twitter app made specifically for iPhone that I noticed, and I had been using it almost every day before I found PocketTweets. The service is beautifully designed as well, but sticks with a black-and-white theme instead of the gradient and color theme that PocketTweets provides. Tweets are laid out with simple black lines designating a new tweet, whereas PocketTweets makes them almost like speech bubbles. That’s not necessarily a bad thing about Hahlo, however, as the service is terrific for minimalists and those who like to use less bandwidth and would rather not wait a bit longer for PocketTweets to load. Similar to PocketTweets, Hahlo allows users to tweet from the main screen with a simple drop down. Hahlo also provides users with options in a bottom toolbar as well, giving them the option to view the public timeline, direct messages, replies to their messages, and their friends’ tweets. A small option at the bottom also allows users to choose how tweets are organized: in list view, alphabetical view, or avatar view. We’re still in the early stages of iPhone application development. Twitter Mobile doesn’t seem to need to innovate, because the service must remain simple in order to be usable on all web platforms, including those utilizing old protocols like WAP (old before the iPhone’s release). 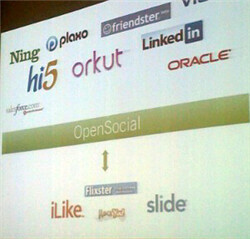 Other mobile specific Twitter platforms remain, but none are tailored to the iPhone as well as Hahlo and PocketTweets. It’s too early to crown a king in the Twitter Mobile arena. At the moment, PocketTweets’ interface and usability trumps Hahlo’s, if only because they provide slightly more eye candy. In the coming weeks, I hope to see the competition heat up, forcing both sites to offer further improvements to their already terrific web apps for the iPhone.